The five-year cyclical bear market gold investors endured is well and truly over. In fact, gold and gold stocks have been, hands down, the hottest investing segments of 2016. In January, gold stocks marked what now looks like the end of their mid-secular bull market correction, and, in less than three short months, the flagship NYSE Arca Gold Bugs Index (HUI) roared higher to double in value. But… after five long years of declining and depressed gold prices, skeptical investors largely sat out the bull run. Don't worry – I'm going to show you why gold stocks remain outright bargains right now, so you'll get the chance to load up on these shares before the next double. Here's Why a Lot of Investors Missed "Round One"
Of course, I'm an enthusiastic gold and metal investor. It was absolutely heartbreaking to watch the yellow stuff plummet from $1,900 to $1,050 over the course of five long, frustrating years – years that saw millions of investors turn away in disgust. So it's completely understandable that those once-bitten gold investors were twice-shy about trusting the conviction behind gold's incredible bull run of the past few months. There's more than enough momentum for gold stocks to climb that steep wall of worry, and the signs that gold is on a secular upward trend are just too powerful to ignore. Meanwhile, some of the biggest money managers have weighed the evidence for a bull and have reached the same conclusion. Both BlackRock Capital Investment Corp. (Nasdaq: BKCC) and Pacific Investment Management Company (PIMCO) see markedly higher inflation this year, a scenario I pointed out to you just recently. In fact, BlackRock, the world's largest fund manager, thinks gold and inflation-linked bonds make sense. And just a few weeks back, "bond god" Jeff Gundlach of DoubleLine Capital repeated his bullish stand on gold, even admitting that he's been adding gold-mining shares to his portfolios. The NYSE ARCA Gold Bugs Index (HUI) is a widely followed index of major gold miners. Dividing the value of that index by the price of gold is a great indicator whether gold stocks are expensive or cheap relative to gold. When the ratio is low, that means gold stocks are cheap in comparison to gold itself. 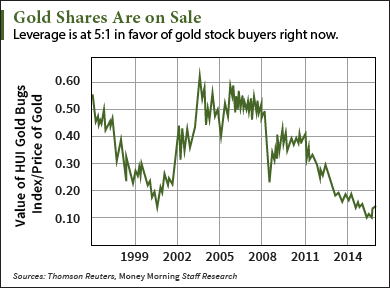 Gold stocks normally offer about a 2:1 leverage – both up and down – on the gold price. Since the start of 2016, gold has risen by over 15%, its largest quarterly rise in almost three decades. But the HUI has risen an astounding 78%, offering 5:1 leverage. The reason is quite simple: Gold stocks had been massively undervalued and oversold over the course of the recent gold bear. The HUI/gold ratio averaged about 0.5 for five years leading up to the 2008 stock market panic sell-off. After that, from 2009 to 2013, the ratio averaged about 0.35. Once gold peaked at $1,900 and headed down to $1,050, sentiment in gold stocks suffered further. By January this year, the HUI/gold ratio had plummeted below 0.10. Effectively, gold stocks had become cheaper than ever relative to gold, cheaper even than at the beginning of the bull market back in 2000. Consider this. When the HUI reached 100 in April 2002, gold traded around $300. Yet when the HUI bottomed at 100 this past January, gold was close to $1,090, nearly three-and-a-half times higher. What this all means is that with the HUI/gold ratio currently at 0.165, it could double to 0.33 and still be below the average level it traded at between 2009 and 2013. In fact, it wouldn't surprise me in the slightest to see gold stocks overshoot on the upside, given how badly crushed they'd become on the downside. Let's just say, there's a lot of ground to be made up. I believe it's going to happen, but the U.S. dollar is going to play a critical role in how that ground gets made up and how fast it happens. 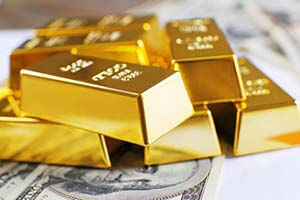 One of the biggest near-term factors influencing the gold price is the U.S. dollar. That's because gold is priced (and carefully watched every second) by investors and traders around the globe in dollars. Despite years of long-term decline, the dollar could be set for a limited counter-trend rally. You see, the U.S. Dollar Index (DXY) has oscillated in a range between 94 and 100 for the past year. It’s currently at 93 and may be setting up to bounce after bottoming near 92. As expectations build for a June rate hike by the Fed, the dollar could gain strength temporarily. But we are really at the cusp, and the DXY really could go either way. It deserves a close watch. If it does head north, it will weigh on gold as a stronger dollar means it takes less to buy each ounce of the metal. Sentiment deserves special attention, too. Recent Commitment of Traders (COT) reports indicate positions that have become extreme and could signal gold weakness ahead. Large speculators, considered by many to be late, "dumb" money, recently held over 200,000 total long gold contracts. This is the most bullish they've been since late 2012, and a level that's been a good contrarian indicator. At the same time, commercial traders, widely accepted as early, "smart" money, have increased their hedges lately against higher gold prices. They reached a four-year extreme net-short position, as they see higher risks of a gold correction. So gold may pull back and take a breather before powering higher. That's almost certain to weigh on gold stocks simultaneously. When that happens, investors who've missed the breathtaking rally we've experienced since January will have a tremendous opportunity to profit. In order to participate in the next leg up, consider taking a position in the Sprott Gold Miners ETF (NYSE Arca: SGDM). As I pointed out to you back in February, SGDM is performance-related, rather than market-cap weighted. It tracks the Sprott Zacks Gold Miners Index, which is rules-based and rebalanced quarterly. Essentially, the rules-based method selects quality over size and then allocates on that basis every three months. In tracking the Sprott Zacks Gold Miners Index, SGDM seeks out the healthiest companies in the sector and adds them to the exchange-traded fund's (ETF's) holdings. The Gold Miners Index identifies about 25 gold stocks with the highest historical beta to the gold price. The weighting also depends on quarterly revenue growth year over year and balance sheet quality (long-term debt to equity). SGDM itself has the common advantages of most ETFs, a low management fee of 0.57%, diversified holdings within the sector, and passive management. With $160 million in assets and even a 1% annual yield, SGDM is a great "one-stop-shop" to gain exposure to gold stocks. When I last wrote about SGDM just two-and-a-half months ago, I said, "It's hard to find a more compelling sector that's ripe to outpace pretty much all of its competition." Now you know where I was coming from – gold is roaring back on a secular bull run for the record books, and the conditions are just about perfect for one of my favorite gold stocks to double from here. 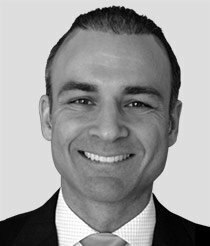 America's #1 Trader, Tom Gentile has given his Money Calendar Alert readers 15 double-or-better wins in the first four months of 2016. And for the past four months, he's been on a mission to find a new way that lets you double your money even faster. Right now, he's putting the finishing touches on a presentation that's going to show regular investors how to place a trade on Monday… and double their money by Friday. We're expecting Tom's event on May 11 to fill up fast, so click here to reserve your spot now. I regularly get ur emails.i take pride and time to read ur emails.because it gives a lot of wealth of information that for a average investor like me.iam very new to the stock market.my wife and I like the gold stocks.and this year we made some money. What is ur take on Yamaha gold and kingross. You know I like you and think you do a really good job. 1) The bear market didn't really start in my opinion until the breakdown … I would say TAKEDOWN by the manipulators … in April of 2013. Until then, gold was just going sideways, consolidating gains after a huge run. And even if you include that sideways period, we're still only looking at a 4 year and 4 month period … from the last days of August 2011 to the end of last year. I get that "5 years" is shorthand. Fine, but it gives the impression that the gold price has been in swoon mode for that long. It hasn't. It did some normal correcting … albeit with some help from the bullion banks to cap the rallies, but it wasn't until Venezuela and Germany demanded their gold back and the dollar was on the ropes that the manipulators started wave after wave of bear raids to discourage people from fleeing to the metals and abandoning the clownbuck. 2) The "commercials" ain't "hedging" nuthin'. These aren't miners selling forwards to lock in a price. The shorts are almost entirely bullion banks who have no legitimate hedging interest. They are simply gaming the system for both profit and to carry out the Exchange Stabilization Fund's campaign to suppress the price of the metals. Their actions contravene the rules of the commodities exchange and are criminal in nature. And yet, nothing is done. Why? Because it's all being done on orders from the Feds. Cops seldom arrest their own. That's why the 5 year CFTC "investigation" into the rigging of the silver market found nothing "actionable." Whaddya gonna do, arrest the Treasury Secretary? Besides, the ESF has the legal authority to rig markets. Such is the low state we find the markets and the rule of law into today. Would gold have gone down on its own from 1900+? Yeah, most likely. Would it have collapsed in a 6 sigma selloff in April of 2013 if it hadn't been savagely attacked by a criminal element in the US government and banking complex? I say no way. Would it have stayed down and struggled so long with prices below the cost of production without the heavy hand of the price manipulators weighing down the scales? Absolutely no way. So, is gold a good place to put money right now? Gold is ALWAYS a good place to money, because the currency you're exchanging for gold isn't real money, but gold is. Onw ill last. the other won't. It's always good to have real money. But could your timing be better if you waited? Almost certainly, because the manipulators have sucked a lot of speculators into a trap here and they can trigger the trap door at any moment, as they have dozens of time in those 4.3 years. Will they? Probably. No one knows for sure. Maybe the gameplan has changed, but the risk is very high, as you rightly point out. You could easily get smacked good and hard here. All that said, love the recommendation of SGDM. You're doing readers a real service by highlighting it.